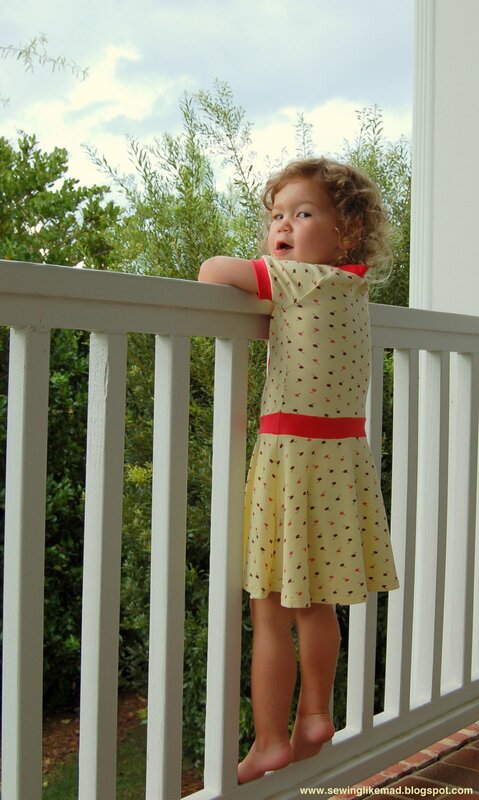 Sewing Like Mad: Jersey dress with a vintage feel. Have I ever mentioned that I also have a love for dresses with a vintage look? I actually think I have mentioned my occasional grandmother style in an earlier post but in case you missed that, I think we have a good example in this dress. Oh boy I love it...ehh, are you even supposed to say that when you made it yourself? Oh well, what I meant to say is that sometimes a project comes out exactly - or even more rare better - than you expected. And this dress is one of them. I apologize but I could just not control myself when I saw this 1960s filter in my photo editing program. I mean c'mon! Okay, so what made me decide to make this dress with the smoking inspired front yoke....in knit? Well, for several reasons. First I have decided to challenge myself more when it comes to sewing as in put some more details on the clothes that I am making. The kids are not exactly missing clothes so no reason to rush. I am the type who gets frustrated if a project takes too long and when I start on something I want to finish it within reasonable time. We have done some changes to the kids' preschool schedule and I now have 3 mornings for sewing so that will help. Oooh, I was suppose to go grocery shopping, get some exercise or tidy up when the kids are in school? Whatever, I will never win the prize for best housewife anyway, haha. And I mean there is no doubt that the more work you put into a garment the more happy you will be with the finished result, right. The last reason is the fabrics I ended up choosing. Since I bought the yellow fabric with the flowers I knew it had to become a dress. And you know how I love to mix fabrics and that dark coral/dusty pink fabric was just a perfect match. But is is also the type of knit that is quite firm and not that stretchy or soft and that is actually an advantage when you what to sew/stitch in it. Not like the yellow one that is super soft, has a beautiful drape and is perfect for the semi full skirt this dress has. 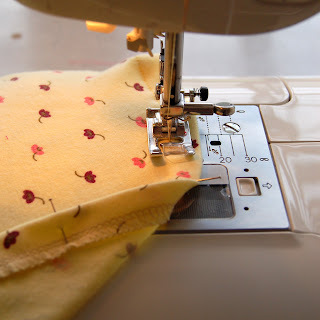 I want to share this little trick for hemming knit fabric with a domestic sewing machine that I have googled myself to. And I have been using it ever since (and probably will continue to do until I get my industrial sewing machine). I did not like the result before when I was trying to hem a knit garment sewing from the inside of the skirt (or t-shirt, sleeve etc). So via google did I end up on this website Genie Centre that many of you probably already knows. Judith the Genie said to sew your hem from the right side of the fabric - like you see on the photo above - and yippie that worked (but don't think you can skip the ironing afterwards). 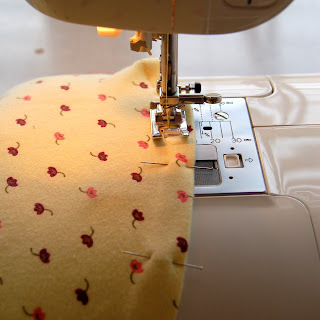 Since you have the visible overlock seam on the inside the result is not completely beautiful. But the outside is smooth and the seam is even so for homemade use it is, at least for me, good enough. By the way don't forget to change to ball point needles before you start sewing - they are made for knits. So here we are with another jersey dress made from the same (self drafted) base that the dress my last post showed but still so very different. Look HERE to see what link parties this post is participating in. Wow....!!! Awesome......!!! Thanks for sharing such a fabulous idea. So pretty! 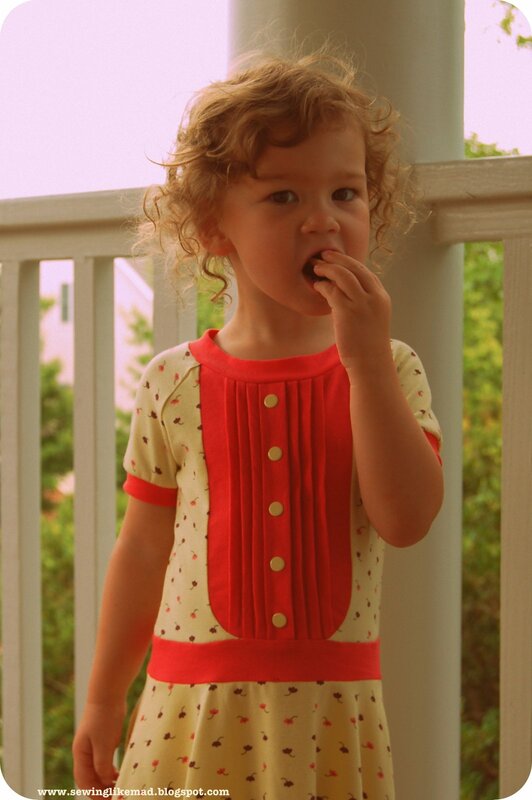 I love the pleats! I love this!! So adorable!! I don't have a lot of experience with domestic sewing machines. But I have a JUKI which is the same brand as the industrial sewing machine I had (and hopefully soon will buy again). And the domestic JUKI works very well....but I have a hard time judging whether it's better than others? I would say Bernina has a good reputation and also the brand Pfaff. I love that dress! Way cute. Adore! Love the vintage look. 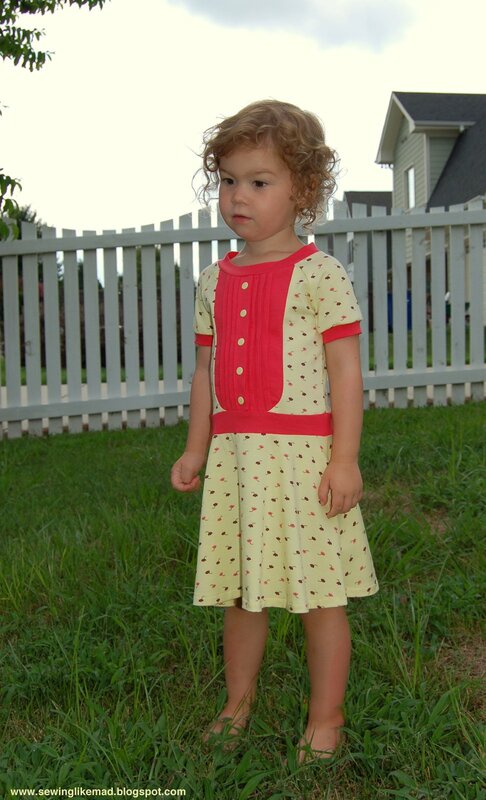 This is sooo stinking adorable.. That sweet dress reminds me of little orphan Annie.. I just love it! What a lovely dress! 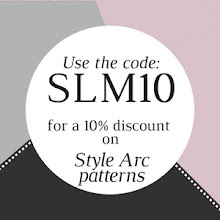 The design and the colors are perfect on your sweet model. And that vintage photo effect looks great too! It is so very different! And I love this one too! The colours and the smocking are lovely. Do most people sew hems from the inside? I've always done it outside up so that I don't have my bobbin thread showing. Whoohoo, nice to know I'm doing something properly. Thanks for sharing at Etcetorize this week! I don't know what other people do but I normally hem from the inside....unless knit (from not that long ago :-) If your bobbin thread does not look like your upper thread there could be something wrong with the tension. Try to tighten or loosen the little screw on your bobbin case (or whatever it is called in English). See if that helps. Wow, that is so cute. What in inspiration! You should put up a tutorial for this! It's darling! BEAUTIFUL!!!! I love everything about this dress! Such a sweet dress! Thanks so much for sharing it with us this week! Hope you have a wonderful week! I'm in love with this dress! I think it turned out beautifully. 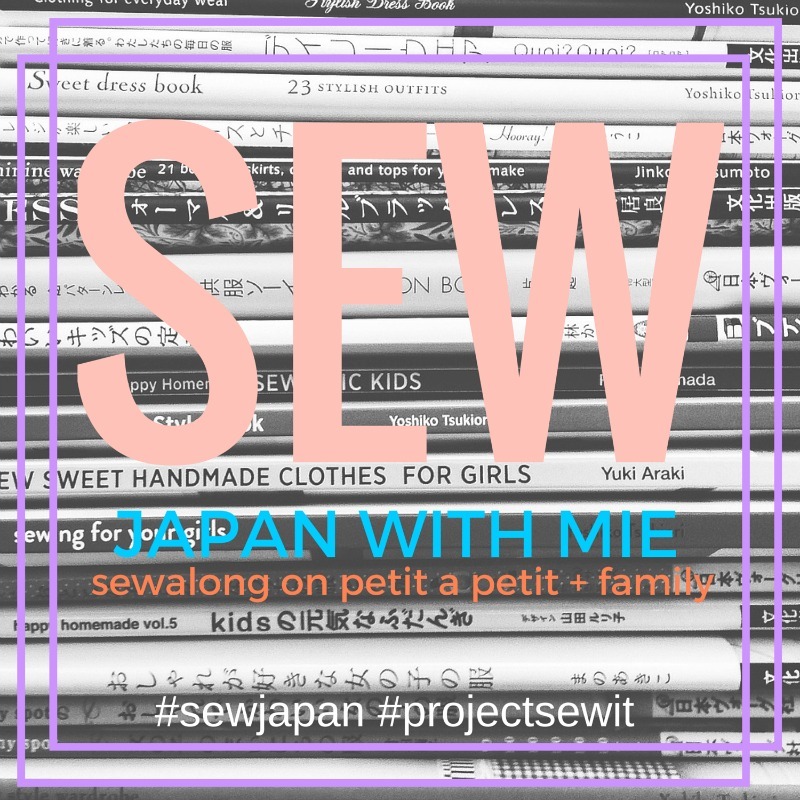 Excited to have found you from the sew much ado link up! This is darling! I think it turned out perfect. I'd love you to link up over at ONE little MOMMA for WKWW-What Kids Wore Wednesday. Hi Mie, I love love love the dress! It is perfect and the model makes it look from its best side! 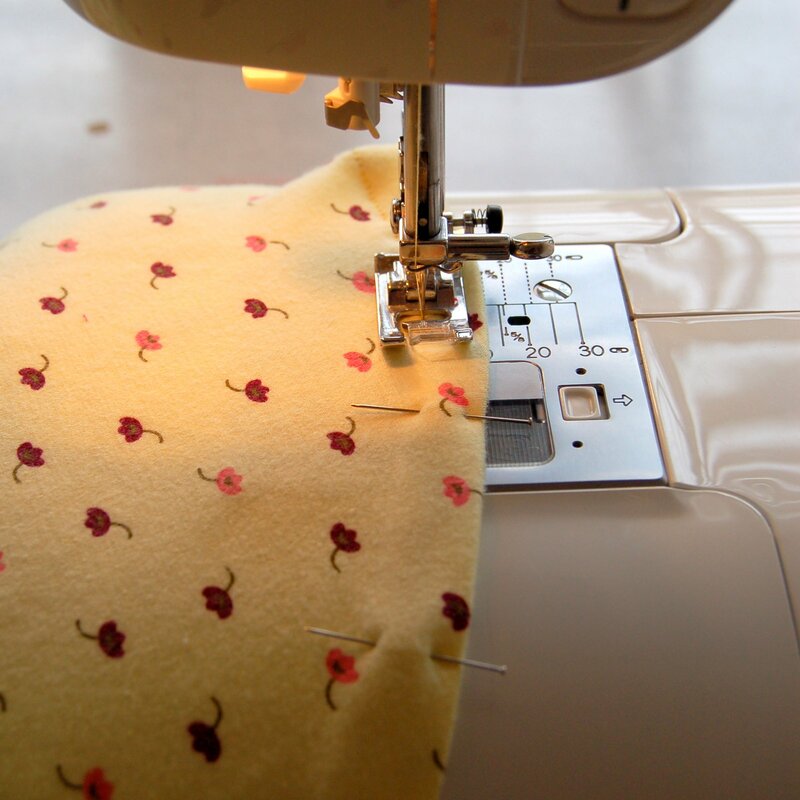 You can also use twin needles for making the hem stitching, it looks quite nice and makes the hem stretchable. The dress is adorable!!! Thanks so much for linking up at our (Heart)&(Home) gathering :) Your pretty dress was featured today! feel free to come grab a featured button. This is seriously adorable. I love knits just because kid's prefer them! You did it so well, it looks amazing!